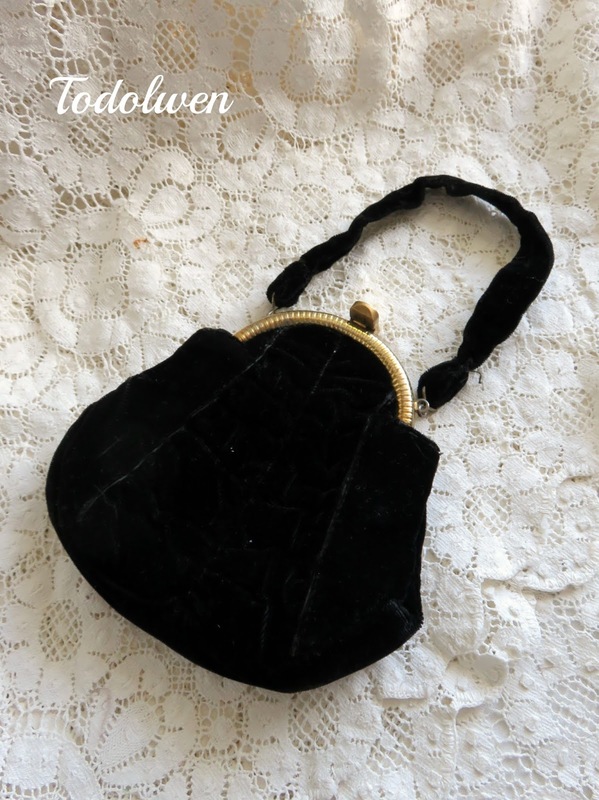 a little while ago my younger daughter decided to decluttered her room and amongst the things she was letting go was a little vintage black velvet handbag. She had bought it at an antique store on one of our visits but now she no longer wanted it anymore. 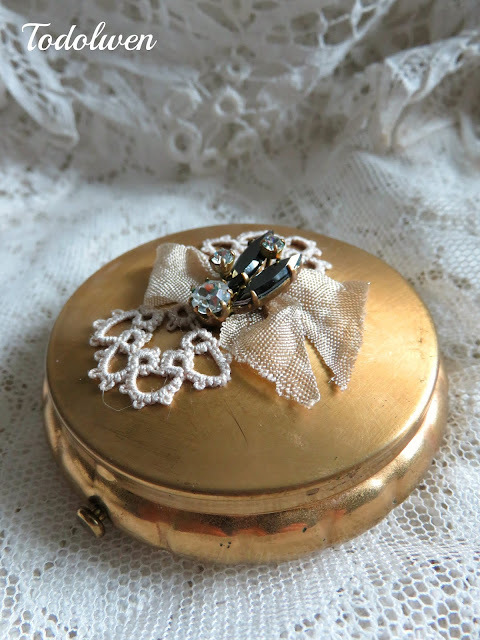 It is such a neat and delightful little thing and I liked it so much so my sweet daughter and gave it to me to work with. As soon as it was on my worktable I knew exactly what I wanted to do with it. 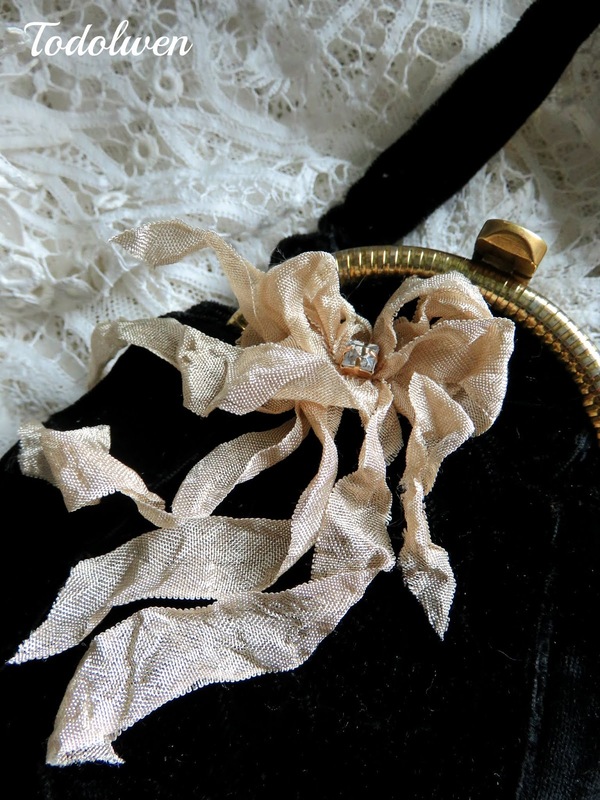 Black velvet, seam binding, some vintage sparkle and a few other things were on hand so I could start to work on my idea right away. My design slowly but surely came to life bit by bit. One by one, each part of my newest creation was made and now everything is finished and I am so happy to share the result of my work with all of you today. "That Little Black Bag" and this is it! This is what that little black bag looks like now on the outside. I didn't want to add too much but also not too little and I think I achieved exactly what I had hoped for ... a touch of elegance. But wait! ... There is more to it! 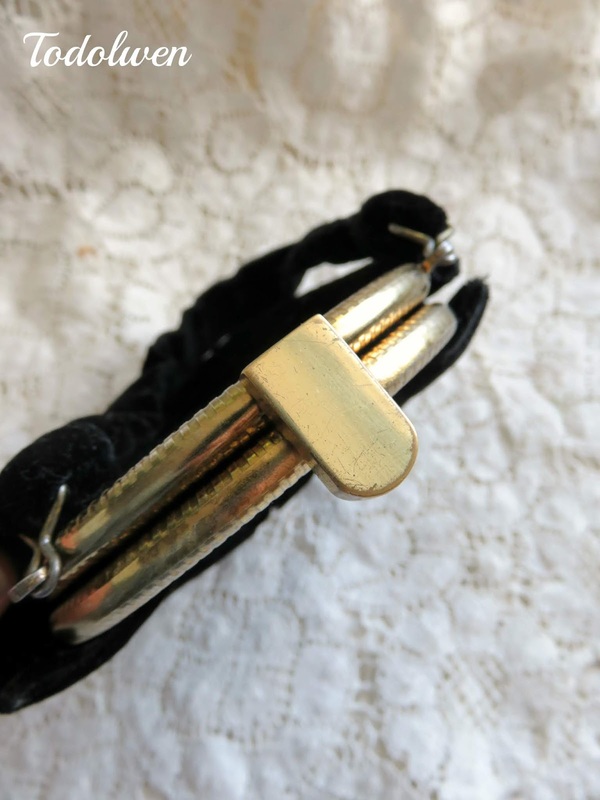 Of course a little black handbag has told hold some neat and useful bits and pieces and because of that, this one does so. 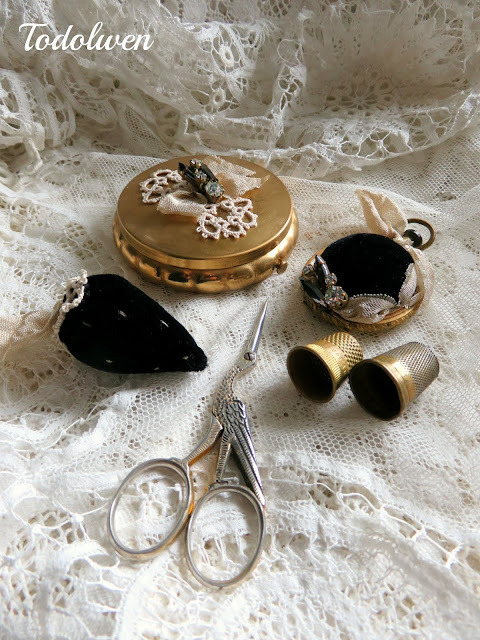 It has almost everything a sewing girl needs. ... waiting to hold needles and pins safe. 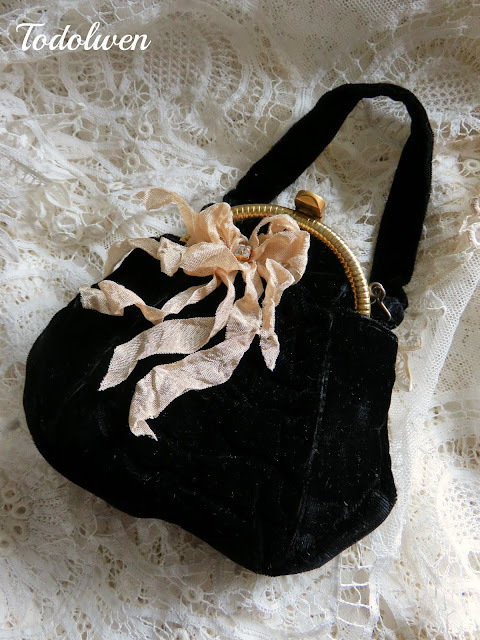 I covered the inside with black velvet and seam binding to match the handbag. Then is a black velvet strawberry. Again all dressed up with old tatting and seam binding and filled with crushed walnut shells to sharpen those needles and pins. 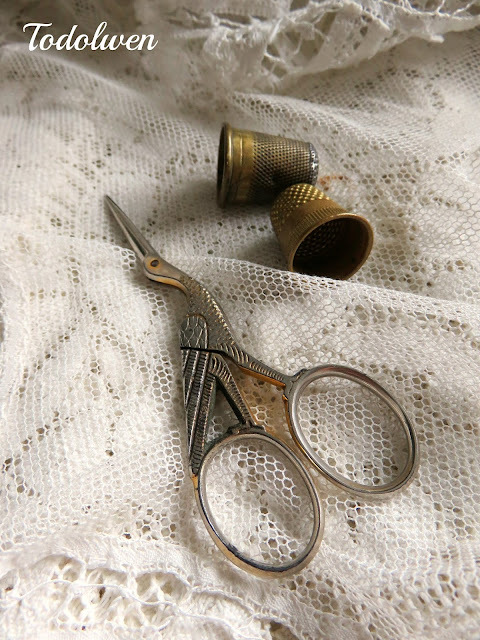 ... some neat old scissors to cut any thread and two old thimbles to keep your finger tips unhurt. 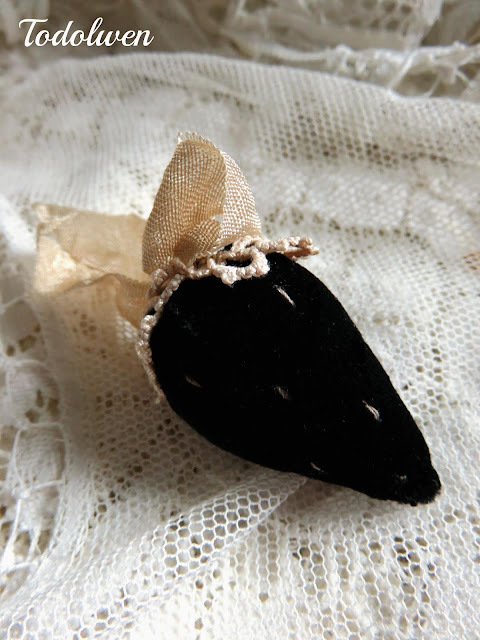 ... of course a pincushion is required! 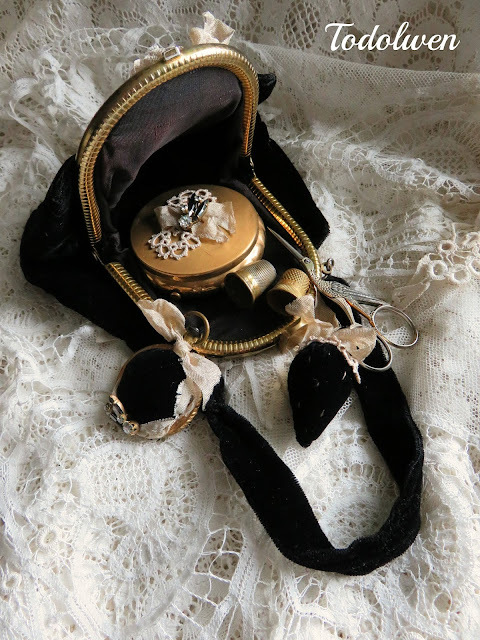 I made one of my pocket watch pincushions for the little black bag and decorated it matching to the other neat bits and pieces. All put together, they all make my newest creations complete and I am so very pleased with the way it has turned out, just as I had hoped it would! I love it how something pretty as it is can become something a bit unusual and simply elegant. 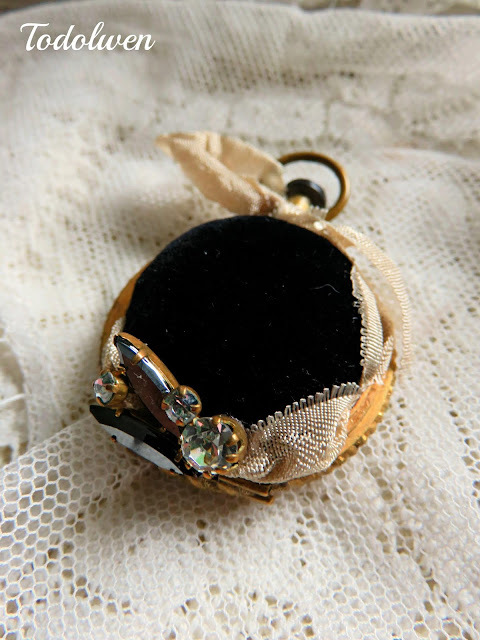 I will be listing his little bag for sale in my Etsy shop in the next few days for anyone interested. It is so nice that you decided to stop by today and visit me and I hope you have enjoyed your little stay. This is a beautiful creation I love all the detailed parts you put into it! Ahhhhh.... ohhhhhhh....... love it so much Karen! 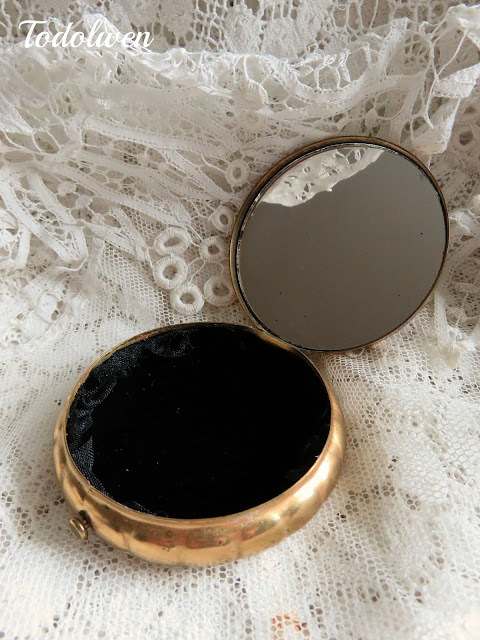 You filled this little handbag with so much love. What a sweet project. 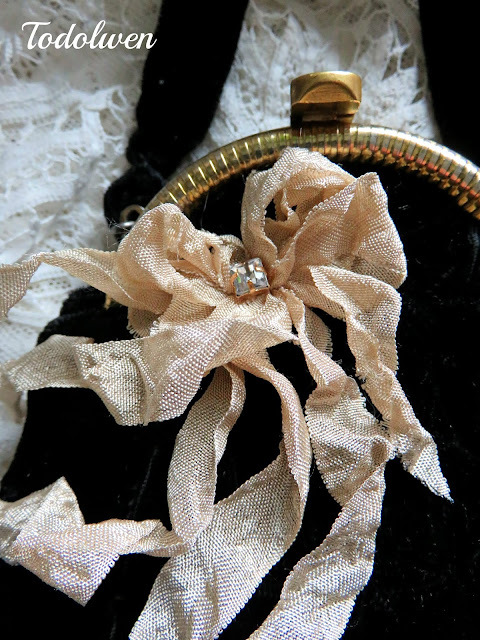 The velvet handbag is darling.